"Check if a site is dangerous before you visit it"
Have you ever visited a website and then received a warning from your antivirus saying that it has just blocked malicious content? Fortunately there is an application that will allow you to take proactive measures against malicious sites. 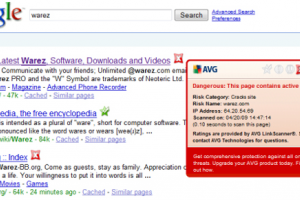 AVG LinkScanner is a small plug-in for web browsers that scans the websites that appear on search results and tells you if they are clean or if they can compromise your computer if you access them. In other words, it just warns you about potentially risky sites. AVG LinkScanner is really easy to install and automatically integrates into your web browser. It is currently available for the three most popular web browsers: Google Chrome, Internet Explorer and Mozilla Firefox. AVG LinkScanner does not block any website, as it just provides preventive protection: you can still access any website you want, even if it is marked as 'Dangerous'. Even better: if you enter a suspicious URL directly in the address bar, the application will still shoot a warning.